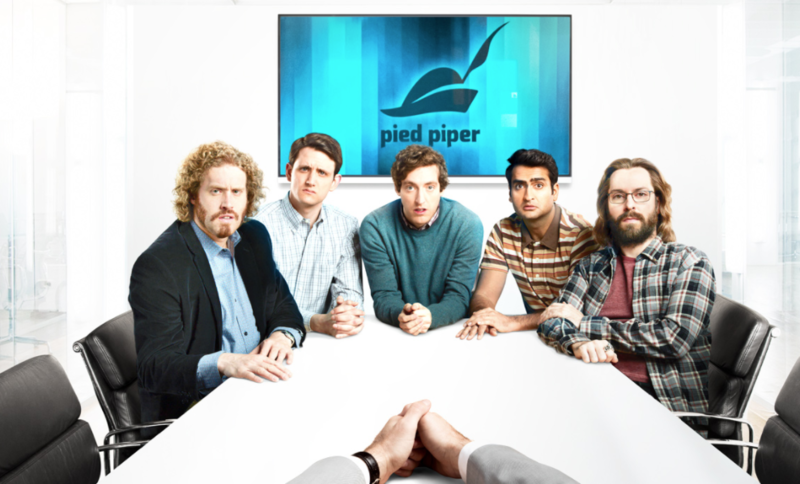 So much has been said and written about the absurd world of entrepreneurship and startups, A whole TV show has been created that depicts most of the absurdities pretty accurately. For me, after transitioning from a CMO position at a startup to a Co-Founder, I find myself facing the same questions day in, day out. 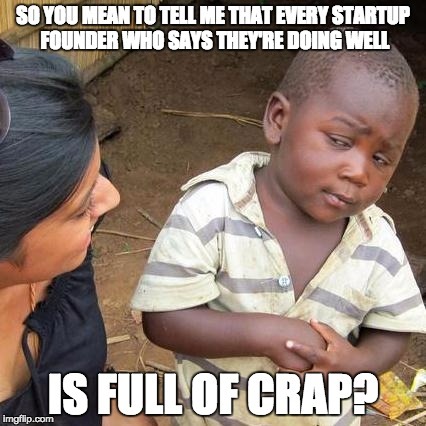 Every startup founder gets these questions and then spends those few very annoying minutes explaining to that distant relative why it makes total sense that they are dedicating their life to a startup that makes no money and won’t be making any money anytime in the foreseeable future. It never works. There are just some things you learn when you build a startup from scratch that those normal people will never understand. I am sure I am forgetting some and maybe I will update this post later when I remember more questions, but here are some of the major ones that drive me crazy! Here is the thing with startups, they are binary. 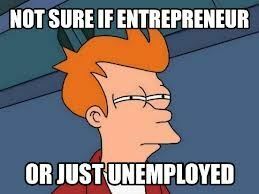 Well, at least most consumer startups are. What do I mean? Well, I am an advisor at a company that has developed some deep technology in the mobile eye tracking space. Now this company raised close to no money over the past few years and has tried hard to define the strategy that will most effectively help them take their tech and turn it into a successful business. Now, every time I see my dad, he always asks “How are the eye guys doing”? And my response is always the same. They aren’t yet succeeding, until they do. Meaning, whether this company will license out its tech or get acquired, for now, like most startups, they are at the bottom of the very nauseating roller coaster than is startup life. Every startup fails until it succeeds. Yes, there are many b2b companies that grow in revenue year over year and there are even some consumer companies that make money but the vast majority can’t say they are “doing well” until they are, Does that make sense? Of course you can’t say that so you spend the next 20 minutes explaining why you aren’t interested in selling now or even generating revenue (more on that below) and are focused on product and “traction” (gotta love that word. Makes me wanna puke.). It is a silly question with no possible good answer. 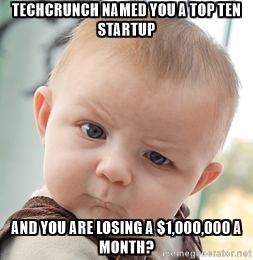 Raise your hand if you have a startup and haven’t had that precise discussion. Ok, minus the drugs part. Exactly. We all get that question. We all get the looks. But the reality is, like it or not, it is extremely difficult to monetize a consumer app/product today when most apps/content/products are available for free. Think about it. Charge for the download? Yea good luck with that. Mobile ads in the app? Great, $1 per every thousand impressions. Don’t spend it all at once. There are of course ways to monetize and companies that have cracked it. See OpenTable for example. The CTO, Joseph Essas always tells me I am insane when I say you cannot monetize a consumer product without critical mass. He did it. But he is the exception, not the rule. So yes, my app/product is free and it is free by choice and I am not stoned or drunk. Can we stop with that question now? Gosh, how much I hate this question! 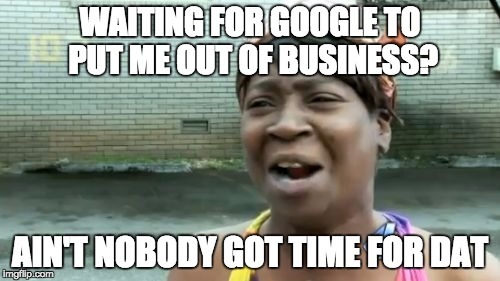 Yes, Google can put me out of business if they decided to enter my space. Google can also put my local super market out of business if it decides to open a super market. It can also put my dry cleaners out of business if it decides to become a dry cleaners company. But Google isn’t a super market or a dry cleaners, and Google is not focused on what I am doing. Oh, and if Google does decide tomorrow to enter my space, well, by then I hope to have executed on my vision so well, that Google won’t build their own version from scratch but will rather collaborate with me, or even better, help me buy my first Bentley. So, yes, Google and Facebook and MySpace and Nokia before them can put anyone out of business if they decide to shift their focus to my space and dedicate enough resources to move as fast as my 4 person startup can move. I get kind of emotional when someone asks me this question. Yes, I patented my social network for dog owners so now, no way Facebook can copy me. Because if Zuck even goes there, I will spend the $.50 I have in the bank to go to court and litigate against Facebook in a court case that will last six years. Sigh. My barrier? How about execution. How about my users? How about my level of engagement with my users? If you go to an investor meeting thinking that the answer to the question “What is your barrier? 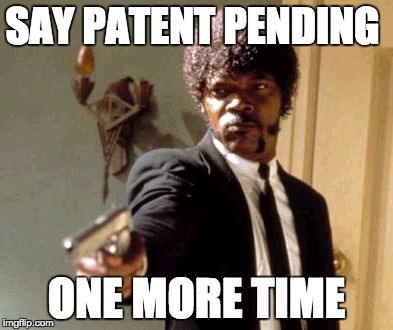 is patents, you are in for a very big surprise. Like I said, there are so many other questions founders get asked regularly, but here are the ones that popped in my head… What would you add to the list? Also, watch this. Watch it now, thank me later! ← It’s 2017, Are We Really Still Sending Those Iritating LinkedIn Messages?